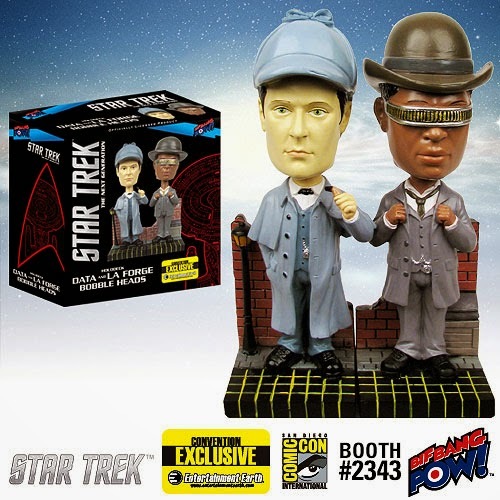 Star Trek: The Next Generation Sherlock Holmes Data and La Forge Bobble Heads - Set of 2 - Convention Exclusive: Based on the classic "Elementary, Dear Data" Season 2 episode, Bif Bang Pow! 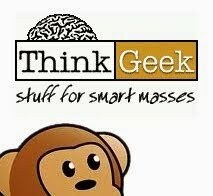 presents Star Trek: The Next Generation Sherlock Holmes Data and La Forge Bobble Heads! 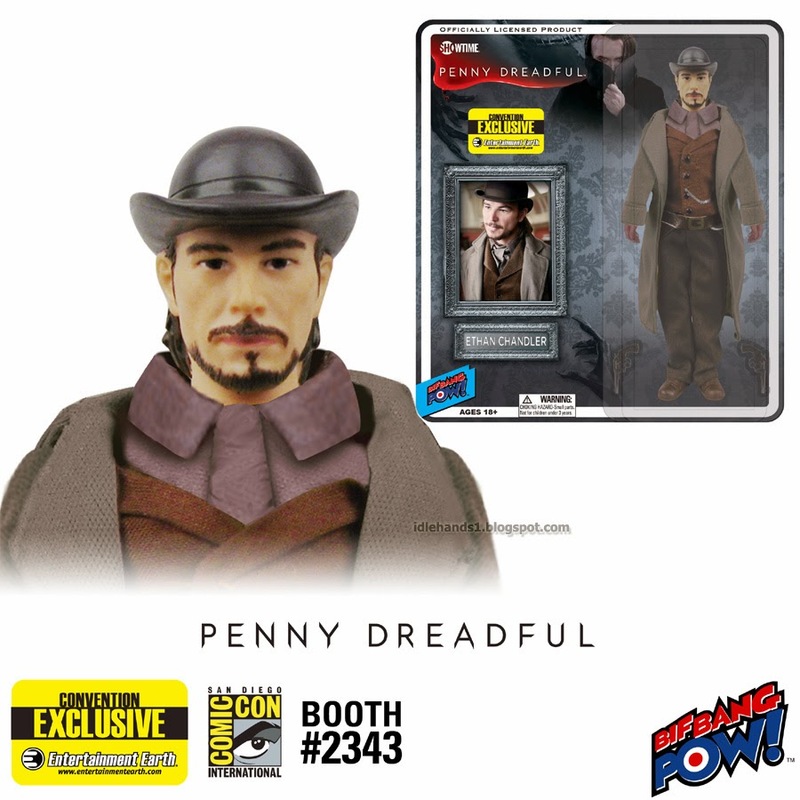 Both 7-inch scale resin bobble heads are designed, sculpted, and painted to replicate the characters' appearance in the episode, and each figure includes a Baker Street-themed backdrop and accessories. Note the detail, including Data/Sherlock's pipe! The bases are part London street and part holodeck, showing that the story is really a holodeck simulation. Bring their adventures to your shelves today! Ordering is elementary. 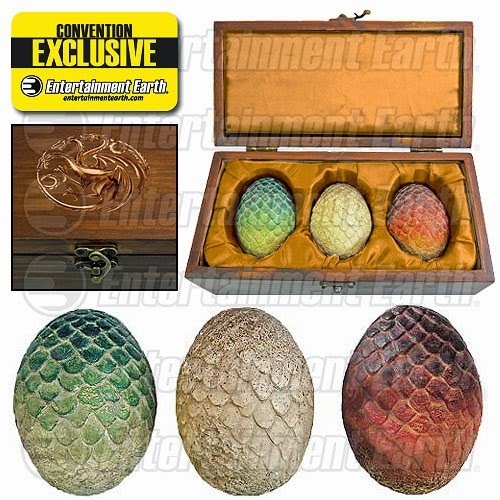 Game of Thrones Dragon Egg Prop Replica Set in Wooden Box with Gold Targaryen Sigil and Gold Satin Lining - Convention Exclusive: A numbered limited edition of only 500 pieces, this extraordinary Game of Thrones Dragon Egg Prop Replica Set in Wooden Box with Gold Targaryen Sigil and Gold Satin Lining – EE Exclusive includes 3 dragon egg prop replicas (Rhaegal, Viserion, and Drogon). They come in a collectible wooden box that's lined with gold satin, features a gold Targaryen sigil on top, and is engraved with the edition number on the bottom. A certificate of authenticity hand signed by the artist is also included. Each egg measures 3-inches tall x 2 1/4-inches wide, while the wooden box measures 9 3/4-inches wide x 5-inches long x 4-inches tall. Together, they weigh over 2 pounds! Venture Bros. 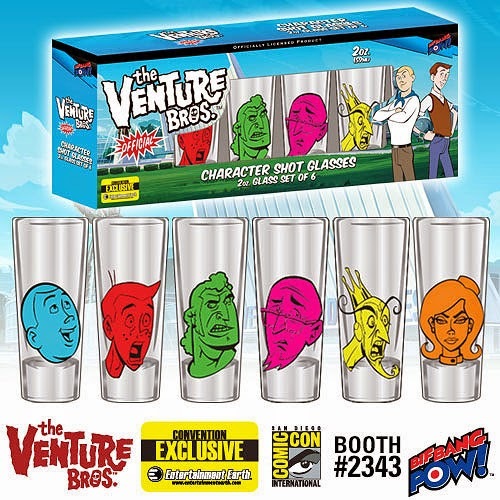 Character Shot Glasses - Set of 6 - Convention Exclusive: Go, Team Venture! If you just can't get enough of The Venture Bros., this Venture Bros. Character Shot Glasses Set of 6 - Convention Exclusive from Bif Bang Pow! is for you. A limited edition, this outstanding set of six 2-ounce shot glasses brings The Venture Bros. home for keeps! 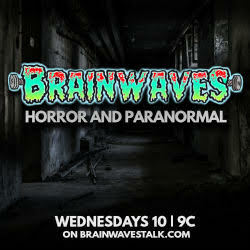 Each features the image of a different character from the show, along with the series logo. In addition to Hank and Dean, there are Dr. Venture, The Monarch, Dr. Mrs. The Monarch, and Brock Samson. 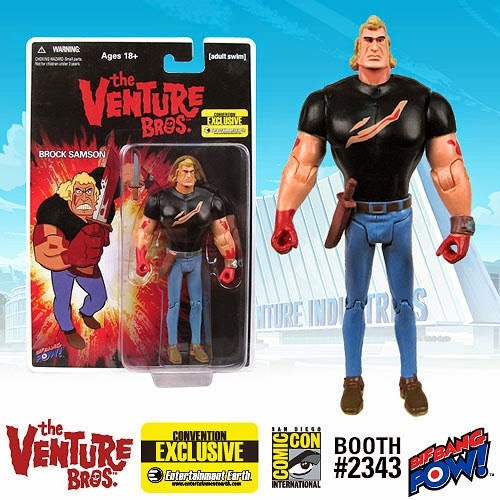 Venture Bros. Brock Bloody Black Shirt 3 3/4-Inch Action Figure - Convention Exclusive: You ought to see the other guy! Brock Samson looks a little worse for wear in this sensational Venture Bros. Brock Bloody 3 3/4-Inch Action Figure from Bif Bang Pow!, but Brock kinda likes it that way, don't you think? With its 1980s style military cardback packaging, this is a Convention Exclusive you don't want to miss! 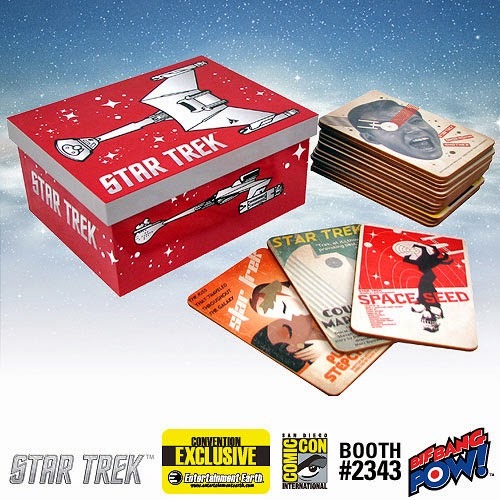 Star Trek: The Original Series Fine Art Coasters Set of 40, Series 2 - Convention Exclusive: Crafted of cork-backed laminated wood and arriving in a laminated wood Klingon Bird of Prey-themed box measuring approximately 8 1/4-inches wide x 6 1/4-inches tall x 3 3/5-inches deep, each of the 40 coasters in Series 2 measures about 5 3/4-inches tall x 3 3/4-inches wide and displays a 4-color image unique to a specific poster and episode. Beam them into your collection now! The Big Bang Theory Sheldon Hawkman 3 3/4-Inch Action Figure - Convention Exclusive: It's Bazinga!™ time. The fan-favorite brilliant theoretical physicist from The Big Bang Theory is here to wow and entertain you with The Big Bang Theory Sheldon Hawkman 3 3/4-Inch Action Figure from Bif Bang Pow!. 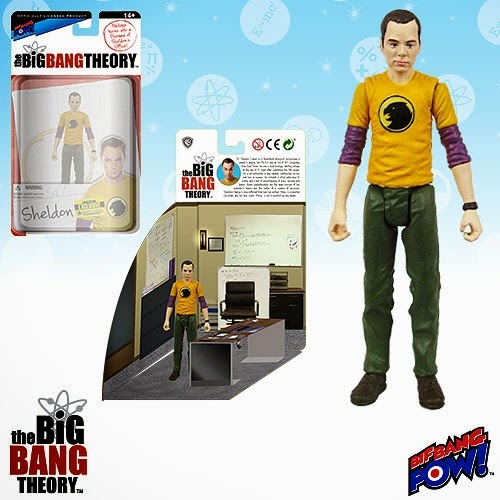 In his yellow Hawkman T-shirt, Sheldon Cooper is crafted of PVC plastic and features 5 points of articulation. You should order him right away! Saturday Night Live 40th Anniversary Shot Glasses Set of 4 - Convention Exclusive: What better way to celebrate 40 years of life and laughter from the one-and-only Saturday Night Live than to fill your hand with an outstanding glass from Bif Bang Pow! 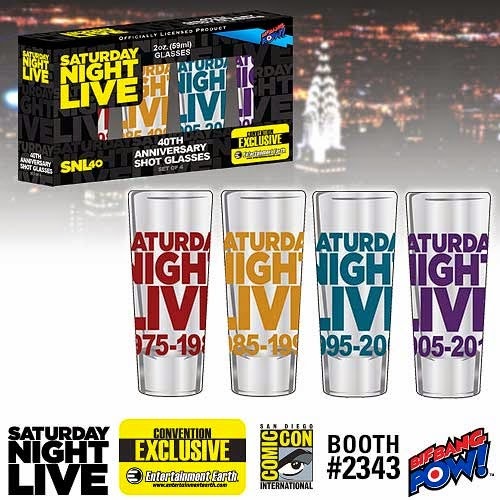 's Saturday Night Live 40th Anniversary Shot Glasses Set of 4? Drink to one of the funniest, longest lasting television shows in history! In vibrant jewel-tone colors, each beautiful 2-ounce glass features the Saturday Night Live logo and commemorates a decade of the show: 1975 - 1985, 1985 - 1995, 1995 - 2005, and 2005 - 2015. No SNL fanatic should be without this 40th anniversary set! Saturday Night Live Drunk Uncle Bobble Head - Convention Exclusive: This crazy, funny bobble head is SNL cast member Bobby Moynihan as "Drunk Uncle." 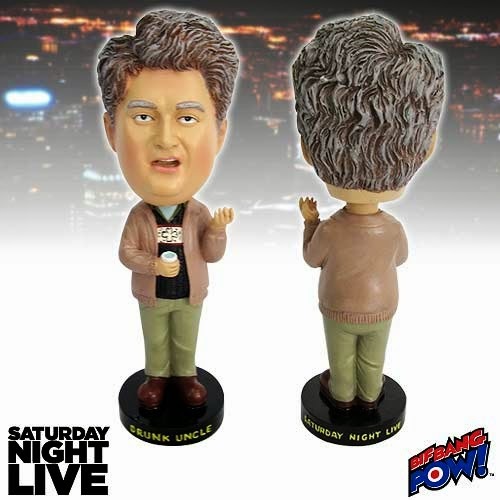 Made of resin and appearing as he does in the show, the 7-inch scale Saturday Night Live Drunk Uncle Bobble Head bobbles away... just like Drunk Uncle! If you're a big fan of Saturday Night Live and its inebriated kinsman, this item is definitely for you. Mike Tyson Mysteries Mike Tyson with Boxing Gloves 8-Inch Action Figure - Convention Exclusive: Solving mysteries is what Mike Tyson is all about. He used to rain violent destruction on anything in front of him, but today he's all about helping others by solving mysteries. 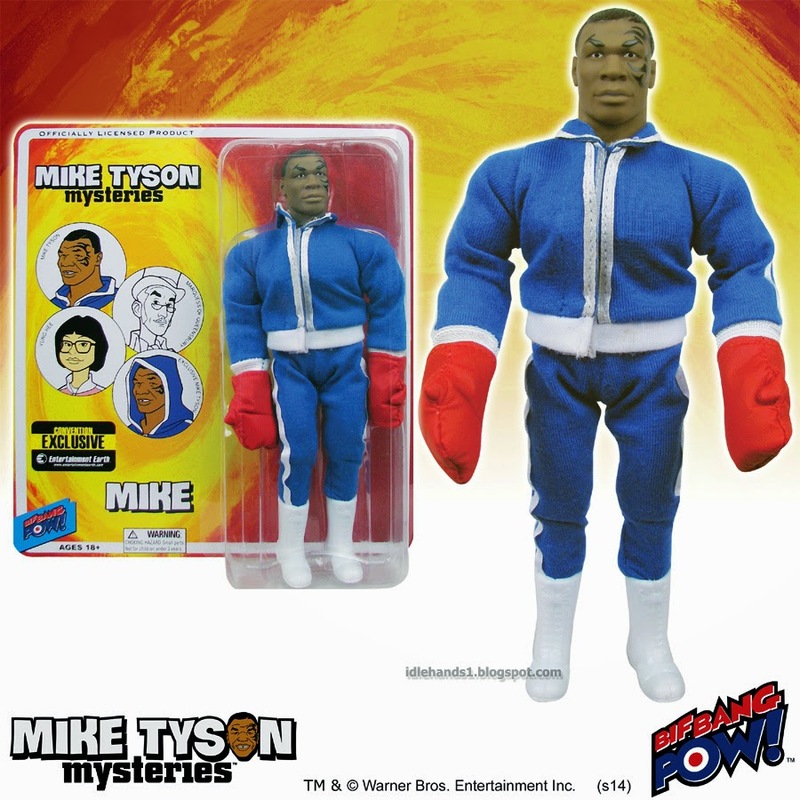 Iron Mike also comes to the world of toys as this retro Mike Tyson Mysteries Mike Tyson 8-Inch Action Figure from Bif Bang Pow! 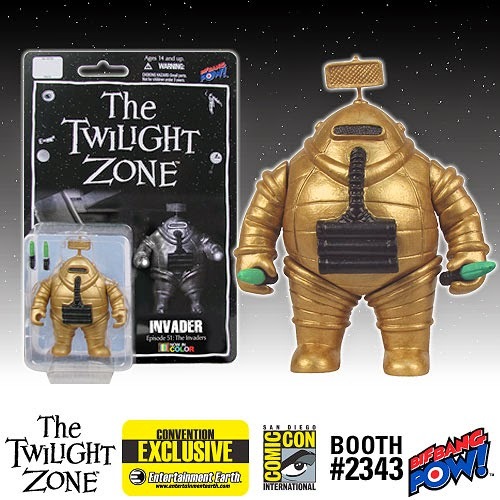 It's the first-ever action figure based on the series! Featuring Tyson's trademark tattoo on his face, a rich blue-and-white cloth sweatsuit with boots, and - in this exclusive only - stuffed red vinyl boxing gloves, the action figure boasts multiple points of articulation and a retro style reminiscent of the best-selling action figures of the 1970s and 1980s. 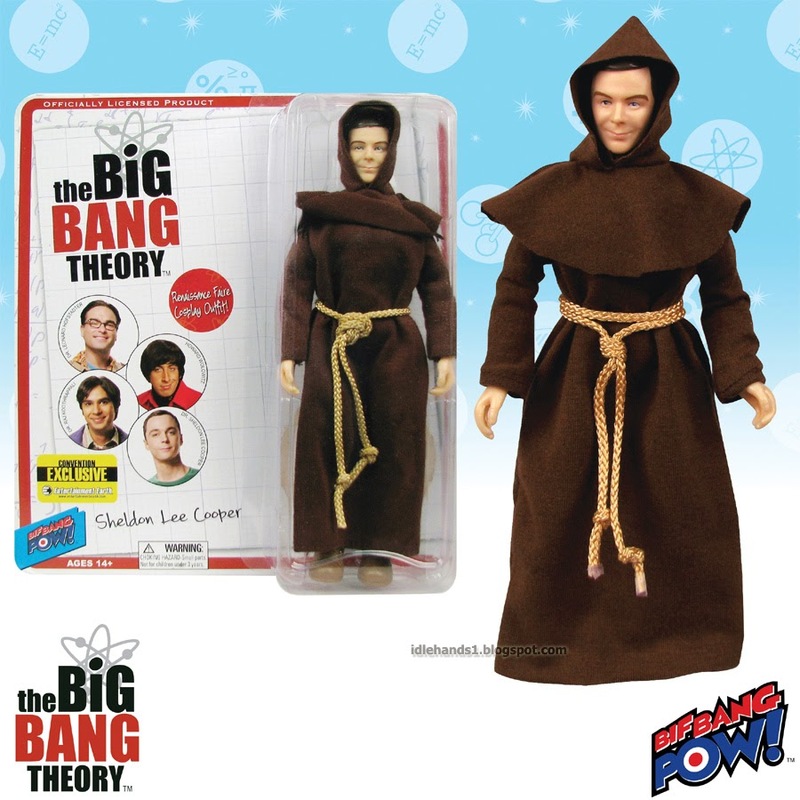 The Big Bang Theory Leonard in Knight Costume 8-Inch Action Figure - Convention Exclusive: What happens when The Big Bang Theory takes on The Renaissance Fair? Bazinga!™ The boys dress up in costume! 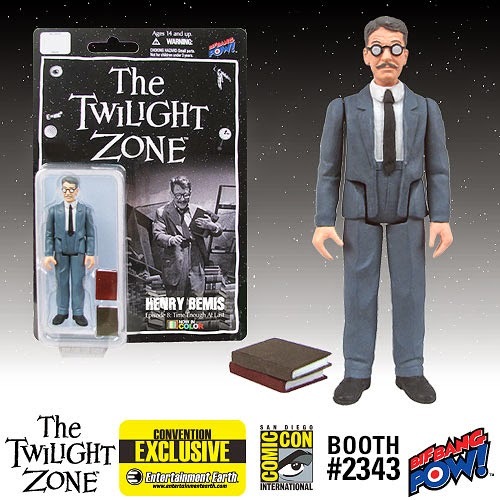 This retro-style 8-Inch action figure features Leonard as a Knight in episode-specific inspired clothing, with multiple points of articulation. 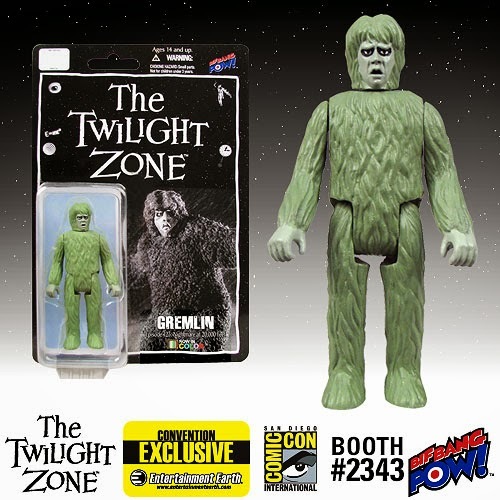 If you're a fan of The Big Bang Theory, Mego, or retro action figures in general, you're going to want this! After all, it's the intelligent thing to do. 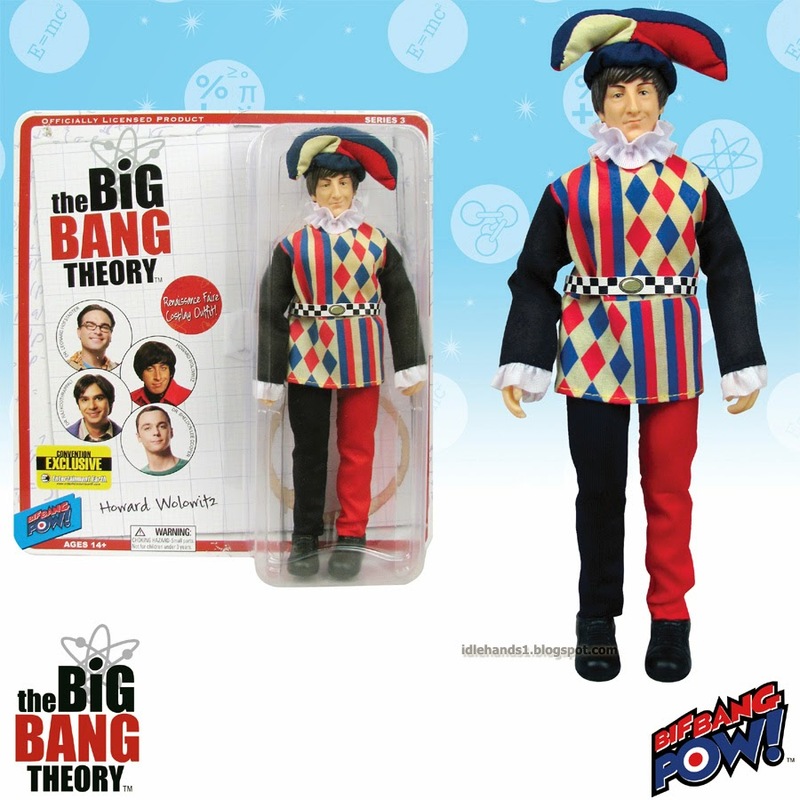 The Big Bang Theory Howard in Jester Costume 8-Inch Action Figure - Convention Exclusive: What happens when The Big Bang Theory takes on The Renaissance Fair? Bazinga!™ The boys dress up in costume! This retro-style 8-Inch action figure features Howard as a Jester in episode-specific inspired clothing, with multiple points of articulation. If you're a fan of The Big Bang Theory, Mego, or retro action figures in general, you're going to want this! After all, it's the intelligent thing to do. 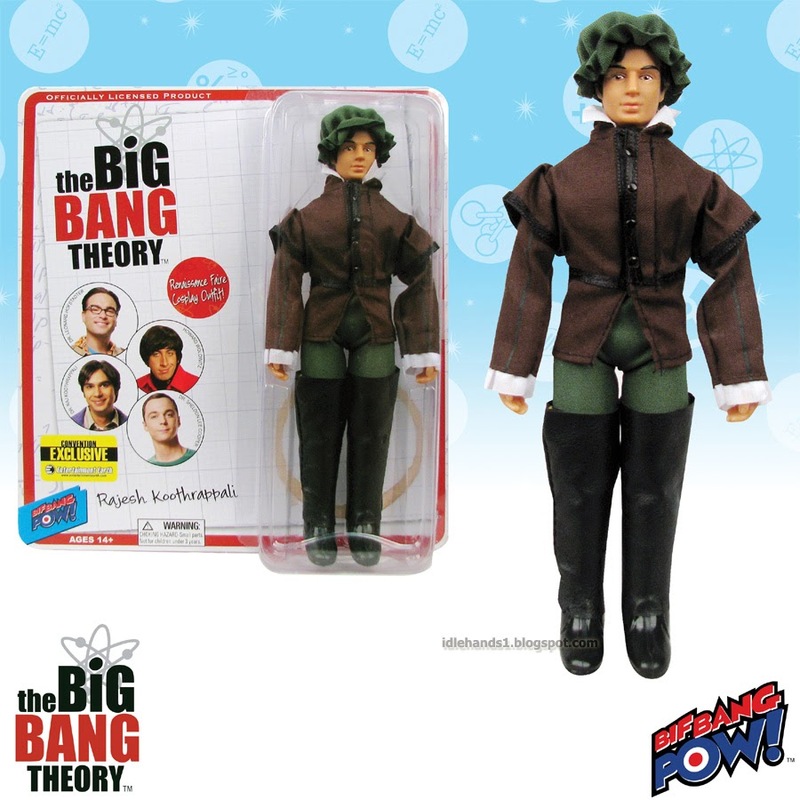 The Big Bang Theory Raj in Gentlemen Costume 8-Inch Action Figure - Convention Exclusive: What happens when The Big Bang Theory takes on The Renaissance Fair? 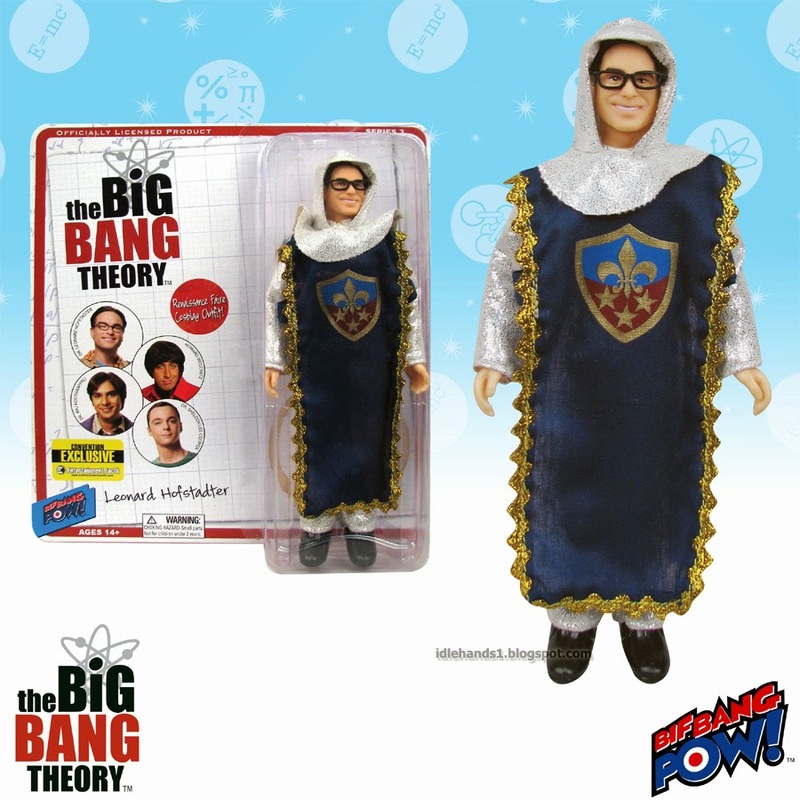 Bazinga!™ This Convention Exclusive features Raj in a gentleman's costume. 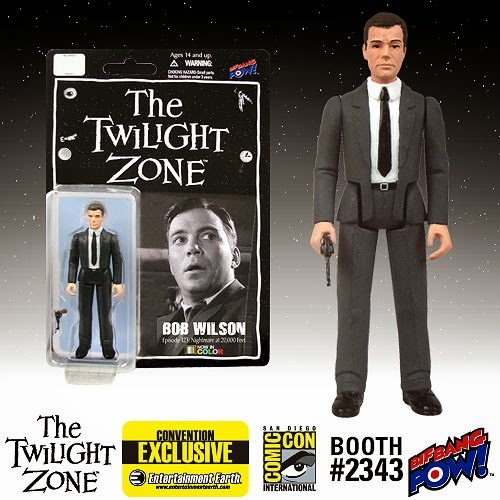 Gentleman Raj is a retro-styled 8-Inch tall action figure that features episode-specific inspired clothing and multiple points of articulation. 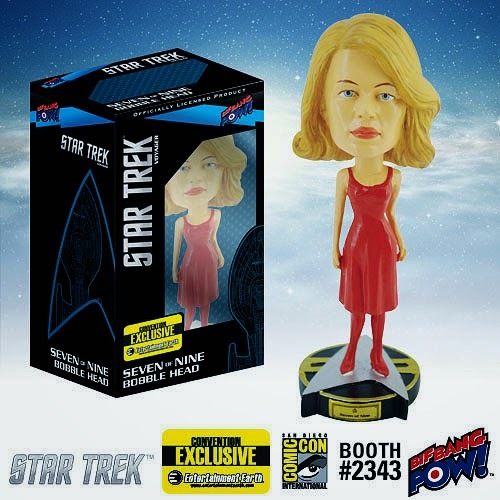 Star Trek: Voyager Seven of Nine Bobble Head - Convention Exclusive: In her famed red dress from Episode #164, "Human Error," this Star Trek Seven of Nine Bobble Head brings you Annika Hansen, aka Seven of Nine (thanks to the Borg), just as you remember her… complete with Borg eye implant and cyborg hand! The black, gold, and silver base features the Star Trek: Voyager delta logo and her name. The terrific resin bobble head stands about 7-inches tall. Adventure Time BMO Tin Tote Gift Set - Convention Exclusive: Who can forget adorable video game console BMO (Beemo) from Cartoon Network's Adventure Time animated TV series? Not Bif Bang Pow!, that's for sure! Introducing our Convention Exclusive Adventure Time BMO Tin Tote Gift Set, tailor made for the show's legions of admirers. Set includes a real metal tin tote, insulated stainless steel container, and hardbound mini-journal. 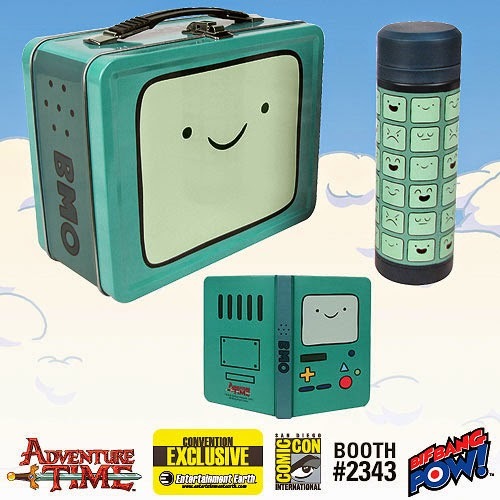 All three items in the set feature gorgeous 4-color Adventure Time-themed artwork spotlighting BMO. What time is it? Time to get yours before they're all gone! 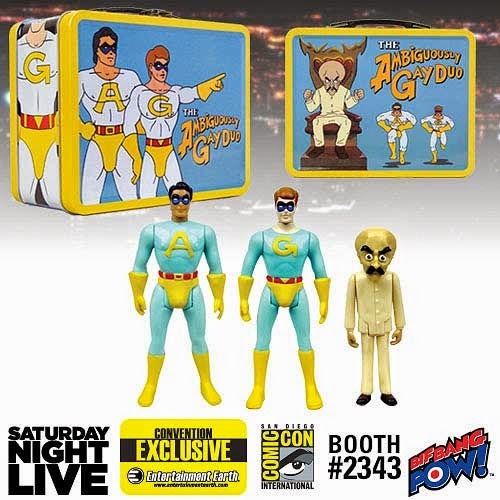 Saturday Night Live The Ambiguously Gay Duo and Bighead 3 3/4-Inch Action Figures in Tin Tote - Convention Exclusive: Inspired by Saturday Night Live's "The Ambiguously Gay Duo" cartoon, this gift set includes an awesome tin tote and three action figures of key characters from the series! The colorful, collectible 8 5/8-inch wide x 7-inch tall x 4-inch deep tote showcases series-true artwork on all sides, including images of Ace and Gary flying, Bighead on his throne, and "The Ambiguously Gay Duo" logo. Inside the metal tote you'll find three very cool 3 3/4-inch scale action figures of "superheroes" Ace and Gary, and the duo's arch-nemesis, Bighead. Appearing just as they do in the cartoon, they feature articulation at the neck, shoulders, and hips so you can reenact your favorite scenes. 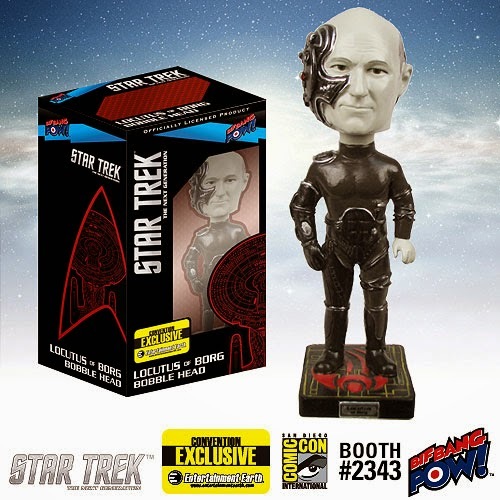 Star Trek: The Next Generation Locutus of Borg Bobble Head - Convention Exclusive: Locutus is here to change your galaxy - and you - in this cybernetic altered take on Captain Picard. Loaded with cables, wires, machines, and the nanoprobes that changed him from the hardworking hero of Starfleet into a pawn of the Borg Collective, this amazing resin bobble head stands approximately 7-inches tall on a Star Trek Borg logo base, ready to do the hive's bidding. So, don't let him get too close to you! 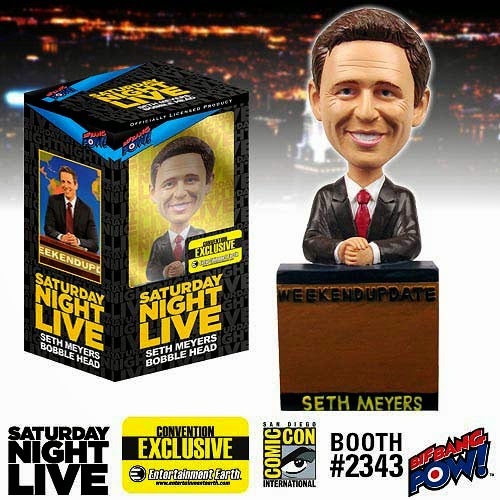 Saturday Night Live Seth Meyers Weekend Update Bobble Head - Convention Exclusive: Really? A Seth Meyers bobble head? Yes! The longtime head writer of Saturday Night Live news parody "Weekend Update," anchor, and late-night TV staple is here to bring you the news of the day as this Saturday Night Live Seth Meyers Weekend Update Bobble Head from Bif Bang Pow!. Ask him anything and he'll nod his head enthusiastically! 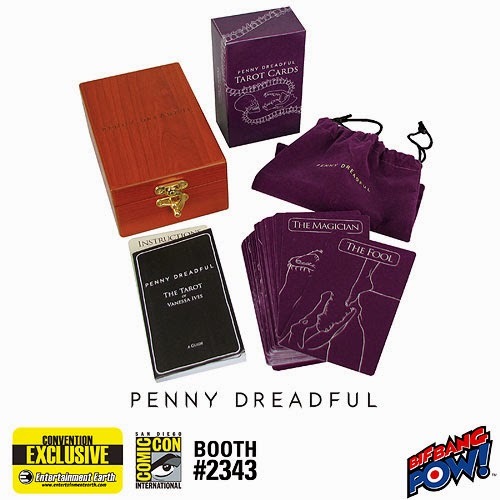 Penny Dreadful Tarot Cards in Engraved Wood Box and Velvet Bag - Set of 78 - Convention Exclusive: What does your future hold? Find out and entertain family and friends with this incredible deck of 78 authentic Penny Dreadful Tarot Cards from Bif Bang Pow!. Just like the cards used by the show's heroine, Vanessa Ives, they feature marvelous series-true artwork and an informative instruction book that will get you into the Tarot Reading action in no time. Plus, this Convention Exclusive comes in a gorgeous engraved wooden box! Made of smooth laminated paper, each Tarot card measures about 4 3/4-inches tall x 2 3/4-inches wide, and the deck comes in a themed velveteen drawstring bag that fits very nicely into the 5 7/8-inch tall x 4-inch wide x 3 1/8-inch deep wooden box that features a hinged lid with the Penny Dreadful logo engraved in the top. The instruction book measures about 4 3/4-inches tall x 2 3/4-inches wide and contains card meanings, popular card layouts, and guidelines. It will introduce you to the Tarot and walk you through the information you need to conduct your own Readings! 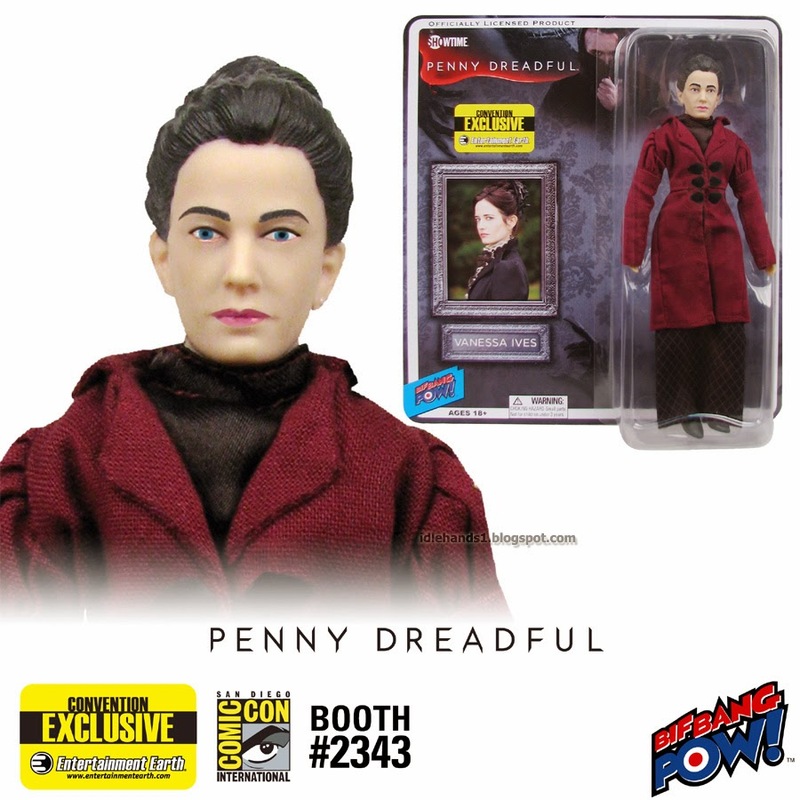 Penny Dreadful Vanessa Ives 8-Inch Action Figure - Convention Exclusive: The enigmatic heroine Vanessa Ives, as portrayed by actress Eva Green in the Showtime drama Penny Dreadful, comes to 3-D life in this exciting Vanessa Ives 8-Inch Action Figure from Bif Bang Pow!. 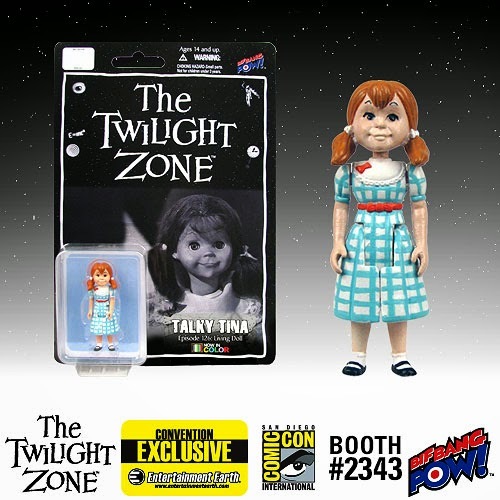 In her patterned satin dress and overcoat, she's the must-have character for your collection, but you'll want every one of these first-ever retro action figures based on the show! 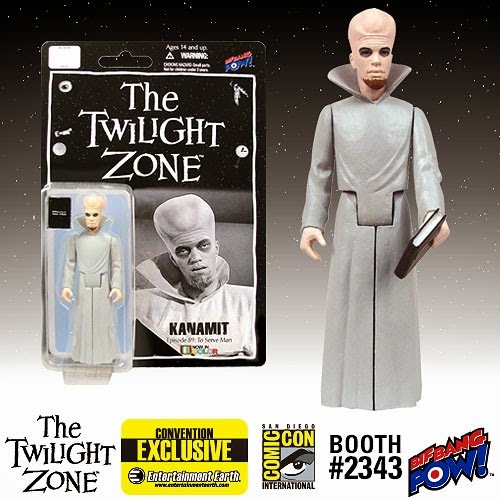 Other action figures sold separately. 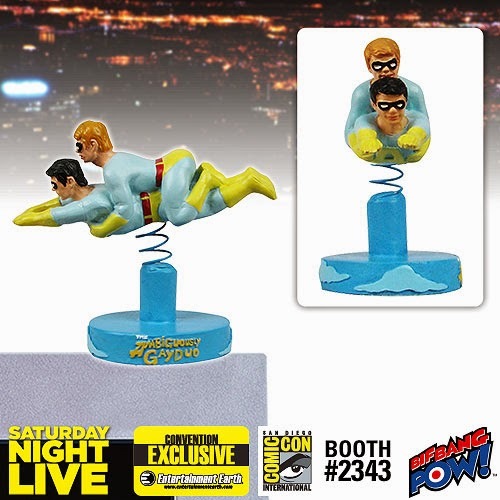 Saturday Night Live Ace and Gary - The Ambiguously Gay Duo Monitor Mate Bobble Heads - Convention Exclusive: Straight from Saturday Night Live, it's that crime-fighting Ambiguously Gay Duo featuring friend-of-friends Ace and Gary! Bif Bang Pow! presents the Saturday Night Live Ace and Gary - The Ambiguously Gay Duo Monitor Mate Bobble Head. This 4-inch scale mini resin bobble head measures about 3 1/4-inches long x 2 1/2-inches tall on a "The Ambiguously Gay Duo" cloud-themed logo base that sticks to your computer monitor with a non-damaging adhesive pad.